From Trade-Ins to Aircraft Management, Financing and Appraisals, we can offer you a complete service. We know the aircraft sales industry. Contact us or one of the following members of our recommended vendors network. AOPA has assembled resources and guidance to make it easy for anyone to obtain a remote pilot certificate with a small unmanned aircraft systems (UAS) rating. The certificate is necessary to conduct operations with a small UAS under the new FAR Part 107, effective Aug. 29. Recreational and hobbyist operators will not be required to obtain a remote pilot certificate, as long as they comply with the special rule for model aircraft. For those without a pilot certificate, some study will probably be necessary, and a date at an FAA authorized testing center is required, while pilots with a certificate already in hand (other than a student pilot certificate) and a current flight review can accomplish the tasks quickly. The FAA published in June the final rule governing operation of unmanned aircraft weighing less than 55 pounds, including new airman standards for remote pilots. With Part 107 to take effect Aug. 29, the agency has released several important documents offering guidance on the knowledge test and certification requirements. AOPA has prepared a handy checklist to guide applicants through the process. For those who hold a pilot certificate (of any grade, except student pilot, for any aircraft category), the process can begin right away. The Part 107 sUAS Course developed by the FAA Safety Team is available online. Successful completion generates a digital certificate and allows pilots to submit an application for the remote pilot certificate through the Integrated Airman Certification and Rating Application (IACRA) system. Once the certificate application is submitted through IACRA (applying by paper is also an option, though it requires more time), the pilot will need to visit a CFI, designated pilot examiner (DPE), airman certification representative (ACR) for a flight school, or staff at the local FAA flight standards district office (FSDO). Candidates present photo identification, the online course completion certificate, documentation of a current flight review, their pilot certificate, IACRA application ID number, and the FAA tracking number (FTN) to complete the process. An ACR, FSDO, or DPE can issue a temporary certificate on the spot; pilots whose documents are validated by a CFI will receive instructions from the FAA by email to access a temporary certificate online. For those without a pilot certificate (or for pilots who would prefer to pay the test fee and take the FAA knowledge test at an authorized testing center), the path to remote pilot certification is somewhat longer, and they will have to wait until the FAA knowledge test is available on or after Aug. 29. Those applicants should be familiar with the remote pilot–small unmanned aircraft systemscertification standards, and be prepared to be tested on aeronautical knowledge applicable to unmanned aircraft operations including airspace classification and other subjects. An advisory circular details the regulatory requirements for Part 107 operations. The FAA has also published aknowledge test guide and sample test questions to help applicants with the process. After passing the FAA knowledge test, applicants can submit an online application for a remote pilot certificate through IACRA. Upon successful completion of TSA security vetting, applicants will receive instructions by email to access a temporary certificate. AOPA and the FAA are urging all applicants who do not yet have an IACRA account to register right away in order to expedite the certificate application process and prevent delays. The FAA is expected to make the remote pilot certificate application available Aug. 29. Part 107 will make it unnecessary for many operators to petition for exemption to one or more federal aviation regulations in order to conduct small UAS flights. The current exemption process has proved to be cumbersome, with applicants waiting months for FAA approval. 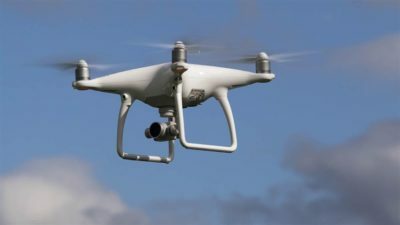 Part 107 will eliminate the need for special approval of many types of aerial photography and other commercial operations, along with educational uses. Small UAS operators who have received a Section 333 exemption may operate under Part 107 if they obtain the necessary remote pilot certificate, or they may continue operating under the terms of their exemption. Recreational and hobbyist operators will not be required to obtain a remote pilot certificate, as long as they comply with the special rule for model aircraft. More information on recreational use of model aircraft is available through the online Know Before You Fly safety campaign (an effort backed by many organizations including AOPA), and AOPA’s “Best Practices for Flying Your Drone Near an Airport” publication. Cameron Lawson, an Alaska native, commercial pilot, mountaineer, and photographer, has joined me on this ferry trip of a 2001 American Champion Citabria 7GCBC Explorer going to a new owner in Minnesota. I’m familiar with the Citabria, and Lawson knows this territory—having flown over, hiked, biked, and kayaked almost all of it. Despite an idyllic start, before the day is over we’ll confront low fuel, worsening weather, and other challenges typical of this region. I follow the Anchorage departure controller’s clearance and guide the tube-and-fabric aircraft in a right turn to the southeast; climb to 3,500 feet; and follow the deep, glacier-carved valleys that lead to the coast. A pair of F–15 fighters scream in to land at Elmendorf Air Force Base, and gargantuan UPS and FedEx cargo jets leave Anchorage International Airport just below and behind us. But only 35 minutes after takeoff from the world’s most active seaplane base, our radio goes silent and the transponder reply light stops blinking. We’re out of Anchorage radio and radar range, and ATC won’t see or hear from us until we show up in Juneau about 500 nautical miles away. Ahead of us lies some of the most spectacular wilderness on the planet—and it’s as rugged as it is remote. The weather is sunny and mild, but it’s not going to stay that way. A low-pressure system spinning up from the south is forecast to bring clouds, rain, and low ceilings in 24 hours. The first sign of that impending weather change is a strong headwind at our chosen cruise altitude of 5,500 feet. At our current groundspeed, we won’t make it to our first planned fuel stop at Yakutat, but there are other options. We drop down to 1,500 feet and our groundspeed improves with a light tailwind. The landscape becomes mesmerizing. Prince William Sound is a bowl of deep blue water surrounded by snow-capped peaks on three sides, and it shows no obvious scars of the massive oil spill that did so much damage here in 1989. Two gigantic oil tankers pass in the sound: an empty one sitting tall in the water heading to the Port of Valdez, and a full one with a low waterline pointed out to the open sea. Fishing boats abound as Chinook and silver salmon gather offshore, preparing for their life-capping dashes up rushing rivers to their birthplaces. I’m tracking our progress on the airplane’s GPS and an iPad, and Lawson is doing the same with a VFR sectional and a wristwatch. We both agree it would be wise to land short of our planned fuel stop to fill the tanks and confirm our rate of avgas consumption. We swoop low over the seaside town of Cordova, where seagulls swarm fishing boats outside the tiny, packed harbor. Then we touch down on the 1,800-foot gravel strip where happily, a fresh sea breeze is aligned with the runway. The avgas top-off confirms our 160-horsepower engine burns slightly less than eight gallons an hour at cruise, just as anticipated, and oil consumption is almost nil. We continue southeast over the Copper River Delta, scene of one of the world’s largest annual sockeye salmon runs. Bear tracks are visible on the muddy ground, a sign the coastal brown bears that feast on the fish are ready for them to make their yearly arrival. It’s too early in the season for the red-colored salmon to begin their charge up the opaque river, however, and we see just two thin and presumably hungry bears walking listlessly near the broad and deserted beach. Beyond the delta, massive peaks—some of them covered by glaciers—rise to vertigo-inducing heights. We pass by the Bering Glacier, rising to 7,000 feet just a few miles inland, and then the Yahtse and Guyot glaciers are even taller. At Icy Bay, the Malaspina Glacier clings to Mount St. Elias, a jagged, imposing, cloud-shrouded hunk of rock that towers 18,008 feet into the heavens—roughly 10 times higher than the altitude at which we’re traveling. We pass serenely over the bay and its icebergs, some of them electric blue, others encrusted in dirt and silt. The uniformly cold water and ice make for smooth air above. On the coastline near Wrangell-St. Elias National Park, the landscape goes lunar. It’s undulating, strewn with boulders, and dirty gray. Sinkholes create giant pockmarks that look like meteor strikes. We fly over it for many miles before I realize that the uneven surface below isn’t made of earth—it’s a sprawling ice field that is slowly clearing out incalculable quantities of rock and dirt as it relentlessly and forcefully grinds to the sea. We pass the curiously named Disenchantment Bay where a pair of humpback whales cavort near the mouth, then climb and start to turn inland for the most direct route to Juneau, our ultimate destination on this day. We expect to overfly the Melbern Glacier and follow it to Glacier Bay, but strong headwinds radically reduce our groundspeed at the higher altitude. 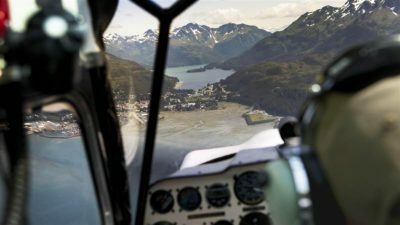 We drop back down along the coast and accept the more circuitous and picturesque route with a groundspeed that should still get us to Juneau with adequate fuel reserves. My Garmin GDL 39 ADS-B receiver shows light to moderate rain about 20 miles southwest of Juneau, light surface winds, and VFR weather throughout the region. Mount Fairweather towers overhead at more than 15,000 feet as we make our way over Lituya Bay, site of a historic tsunami triggered in 1958 by a nearby earthquake. The 7.8-magnitude temblor caused a tremendous landslide that dumped an estimated 30 million cubic meters of rock and ice into the narrow inlet, and the resulting wave slammed into the coastal mountains with terrific force. The tsunami knocked down trees more than 1,700 feet above sea level—a height roughly equal to our current altitude. Hugging the coastline and the increasingly rocky beach, a gray cloud ceiling forms and begins to drop. The ceiling is about 3,500 feet at the foot of Mount Fairweather, and 2,500 feet at the opening to Cross Sound about 15 miles farther south. ADS-B weather shows a clear shot to the nearest airport at Gustavus, but the picture out the windshield isn’t so reassuring. Cross Sound, and Icy Strait beyond it, both are darkened by clouds, lower ceilings, and our GPS groundspeed shows the sudden onset of a powerful headwind. We’ve gone too far to turn back to any other airport, and the coastal mountains and rocky, windswept shore offer no chance of a precautionary off-field landing without severely damaging or destroying the airplane. Rain starts to fall in big, splattering droplets, but visibility beneath the clouds is good, about 20 miles. We press on at reduced power and the leanest possible mixture setting to extend range and endurance. The minutes tick by slowly as we cross the not-so-narrow-looking Sitakaday Narrows to Gustavus. There the rain lightens, the ceiling lifts, and the airport is clearly visible 15 miles away. I can feel myself relax as we get within gliding distance of the sandy, low-lying peninsula where Gustavus (pronounced goo-STAY-vus) is situated, and I make a straight-in approach to Runway 2. We’ve been airborne for four hours: three of them awe-inspiring and delightful, and one of them nerve-wracking—for me, at least. Lawson seems nonplussed and says he never doubted a dry landing. Pilots in this region know that weather forecasts aren’t guaranteed, and actual conditions change dramatically without notice. It’s a lesson I won’t forget. After landing, I taxi to the fuel pump and learn that it’s out of commission and likely to stay that way for a week. There’s an airport with avgas just 20 air miles away at Hoonah—but I’m not even tempted to fly there without more fuel in the tanks. Lawson gets busy taking photos on the ramp, chatting with fellow Alaskans, and laughing. He seems totally unfazed by the fact that fuel is unavailable. He’s sure we’ll soon find a way out of our predicament, and it turns out he’s right. A local pilot has 15 gallons stashed at a nearby hangar, and he’s willing to part with it for a cash payment. The avgas is expensive, but worth it. We go on to Hoonah and top off the tanks, and then fly on to Juneau International Airport where Lawson, his photo assignment complete, catches an airliner home to Montana. With worsening weather along the coast, I turn east—across the mountains—and, for two days, follow the Alaska-Canada Highway the rest of the way to the lower 48. Taking off from Juneau for a VFR flight across the Canadian border, I’m once again struck by the abrupt transition that takes place in just a few short minutes from bustling airport with airliners, corporate jets, and tourist-filled floatplanes and helicopters to vast, uninhabited, and harsh mountain expanses. Even at relatively slow Citabria speed, the changeover happens fast. High-performance turboprop maker will end round-the-world trip at Oshkosh. A team made up of Epic Aircraft owners and staff this month embarked on an aerial journey that truly lives up to the manufacturer’s name. On July 7, six Epic airplanes took off from Oshkosh, Wisconsin, beginning the Epic Odyssey World Tour, a 21-day round-the-world trip that will take the team 15,000 nm through 20 cities in nine countries. The Bend, Oregon-based manufacturer says the tour gives the company a chance to highlight the power and range capabilities of the carbon fiber single-engine turboprop internationally. 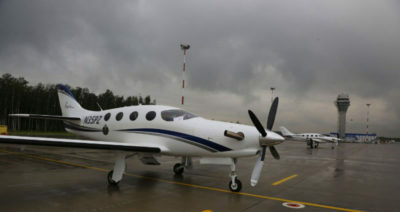 It also gives owners an opportunity to put their plane through the paces. The tour spans two oceans and takes the team through a variety of conditions and terrain, including mountains ranges, volcanic islands and the Siberian tundra. “This is an incredible opportunity for Epic owners to enhance their skills and expand their horizons, while experiencing some truly remarkable places,” said Epic CEO Doug King. Today, the team is in Moscow, about midway through its circumnavigation of the globe, after stops in Canada, Greenland, Iceland, the U.K., Italy and the Czech Republic. The tour continues through Russia, Alaska and the western United States before concluding back in Oshkosh just in time for AirVenture 2016. Thank you for the $896 referral commission I received today as a result of less than two minutes work as a USA FBO referral agent. I look forward to sending you more successful aircraft referrals. I just want to say that Chris and USA Aircraft Brokers did a great professional job of listing the aircraft. I was completely satisfied with his effort, and if ever the occasion should arise again, he will be the person I call. Attached is a photo of one good looking son-of-a-gun. And the guy in the picture ain’t bad either. I am in receipt of USA Aircraft Brokers Check #3094, in the amount of $692.50. I am so grateful for your generous sharing of the bounty. I am encouraged and will redouble my efforts to develop our local market. Thank you!